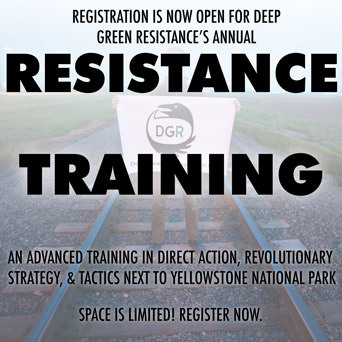 An advanced training in direct action, revolutionary strategy, tactics, and organizing taking place next to Yellowstone National Park. This training is aimed at providing practical skills and networking to activists, organizers, and revolutionaries. Save money with Early Bird Tickets - available for a limited time - register now! Recognizing that our tactics are failing and things are getting worse, this training will focus on escalation and creative, advanced tactics to increase our effectiveness. This training is aimed at activists who are tired of ineffective actions. Topics will include soft and hard blockades, hit and run tactics, police interactions, legal repercussions, operational security, terrain advantages, escalation, and more. Space is Limited - apply now! Priority will be given to front-line activists, marginalized communities, and women. LOCATION: West Yellowstone, Montana — just outside of Yellowstone National Park. LODGING: A shared bunkhouse will be available. Camping will also be available. Bring your own bedding. FOOD: Will be provided, and we can cater to most dietary preferences. Friday will include only a short, optional evening program.